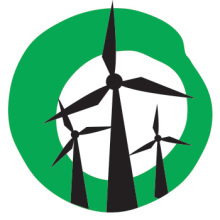 “Prime Minister Tony Abbott’s statement on the alleged health impacts of wind farms are out-of-step with the the view of public health experts,” said Leigh Ewbank, Friends of the Earth’s renewable energy spokesperson. 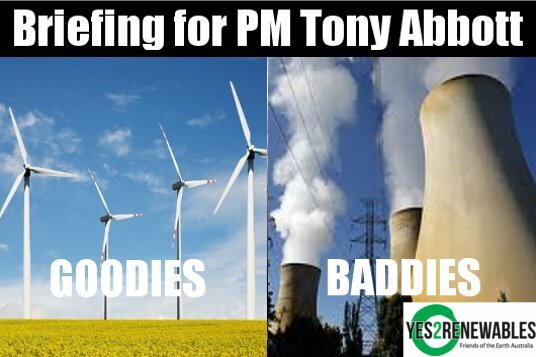 Prime Minister Abbott admitted to Alan Jones that his government has actively sought to stifle the wind energy sector. Friends of the Earth say the Prime Minister has shown his true colours on renewable energy. “The Prime Minister’s admission proves once and for all that his government’s energy policy is ideologically driven,” said Leigh Ewbank. 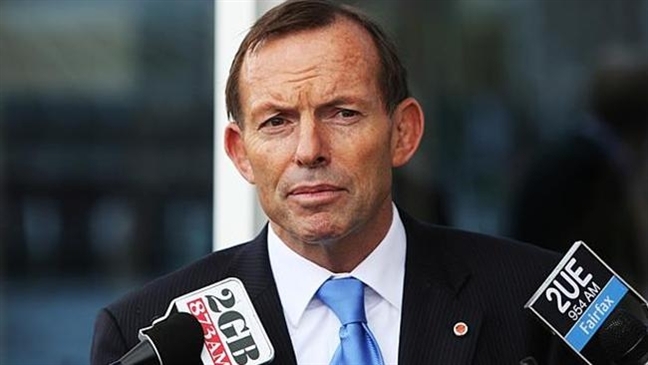 “Renewables energy investment has collapsed by 90 per cent and 2,500 jobs have been lost on PM Abbott’s watch,” said Leigh Ewbank. Is this Satire? the Australian PM really said renewal energies like wind power are ugly and cause health problems.. Nothing worse than an ignorant, greedy capitalist to be in climate change denial. The only purpose has to be about greed and what promises he made to others who line his pockets. Time to get corporations and business men out of Politics. These men are not leaders, they have no clue what true leadership looks like. Women power. Once again our Prime Minister demonstrates his ignorance and dishonesty. Evidently he is listening to the likes of Alan Jones and the cretins opposing wind energy – well he doesn’t have many scientists to advise him since he cut their funding – leading to the ridiculous comments he has made, following the appalling ill informed remarks from his out of touch treasurer. This mob are costing the country dearly. This isn’t just poor taste AND bad economics (20,000 possible jobs and $5bn p/a health costs for air pollution). It’s plain evil. Air pollution actually kills 1,500 Australian’s a year. And he’s worried about ugly? Once again Blair, you are so far out in left field, you have lost your way. Tony Abbott knows exactly what he is doing, it is the wind industry that is costing this country dearly, billions of dollars of taxpayer’s money in subsidies and what do we get, an intermittent, unreliable power supply that is driving electricity prices through the roof. As for wind turbines lowering Co2 levels, that is a complete joke. As for your ‘scientists’, they really have lead you astray, with nothing but a bunch of lies! All they have done is cooked the books and are now being proven wrong time and time again. You don’t have much going for you Blair! As is her wont, TCW is posting personal attacks and claims totally lacking any supporting evidence and quite at odds with the facts. TCW, how would you explain that the last coal-fired power stations in SA are to be shut down, if not that they are being forced out by our wind farms? And you really should give up on denying climate science; that is a lost war; only people like you believe that any more. To claim that wind turbines are inefficient is absurd. The Oxford English Reference Dictionary defines efficiency as: “The ratio of useful work performed to the total energy expended or heat taken in.” A modern wind turbine in Australia typically produces an average of a megawatt of electricity while consuming no fuel – infinite efficiency. Once again you, TCW (The Cowardly Whinger) resort to red herrings, denial and obfuscation to try and hide the fact you are completely out of touch. Never mind that the rest of the world proves you wrong on a daily basis with increasing investment in renewables, while large energy companies and investment groups are divesting themselves from fossil fuels – you just keep on pretending everything is hunky-dory. I do wonder about your sanity. It’s laughable that you think you know more than the AEMO, scientists and others far more informed and intelligent than you. Your ignorance and your arrogance explains why you are so uninformed. We don’t have to wonder about your sanity, Blair. Yep, the investors and banks are divesting themselves from fossil fuels. Hang in there Blair, you’ll get it right one day. Ah, David K. Clarke, you are a regular comedian! One only has to read your blog and they will find personal attacks by the hundreds! You can say that the coal fired power stations are about to be shut down because they have been forced out by renewable energy. What private company can compete with heavily subsidised, intermittent wind power, there one minute, not the next? Of course the fact that Leigh Creek is about to run out of useful coal had nothing to do with it, the fact that one power station was already closed and the other one has gone beyond it’s use by date, had nothing to do with it, the fact that electricity consumption across the country has fallen, because of the the escalating power prices caused by renewable energy, had nothing to do with it. There is no war on climate science, you need to open your eyes, or perhaps that should read, open your mind, your climate driven doomsday theories are exactly that, doomsday theories. Your ‘scientists’ have been cooking the books! There has been very little global warming for eighteen years and none of the predictions put out there by people like Flannery and you, have ever eventuated and are not likely to. If wind turbines are so efficient, why do they have to be so heavily subsidsed by the Government, why won’t the wind turbine companies build wind farms without a guaranteed RET? I guarantee I won’t get a straight answer to that question, Blair never has when I have asked him. Tania, thanks for once again demonstrating your inability to comprehend clear statements. Your questions are answered, you just have no ability to understand them. You’re not very bright. Sad but true. Looks like wind turbines are a thing of the past now. It’s been nice knowing you Blair. Do you drive? Your tenuous grasp on reality would make you a danger on the roads. So Tania, you seem to be at the same time denying and accepting that wind power has forced the closure of the Port Augusta coal fired power stations – after saying that wind farms didn’t achieve emissions reductions. Where is your evidence in support of Leigh Creek being about to run out of coal? What has efficiency got to do with costs? Please explain. And where is your evidence that wind turbines are heavily subsidised by the government? Wind power does receive about $0.04/kWh from the power industry (because the power is emissions free), not from the government. After reading the first two words of your post, I am not even going to bother to waste my time answering your foolish questions, you obviously do not listen to a thing I tell you. You live in the mid north, where have you been, if you did not know that the Leigh Creek coal mine was going to run out of usable coal in 2017? There is nothing wrong with my third paragraph, if you do not understand it, you had better start doing your research, it is exactly what it says, your so called ‘climate scientists’ have been falsely altering the graphs to give the impression of global warming, which hasn’t happened for eighteen years. Bury your head in the sand if you want. Wind power is not efficient, you will not find anyone to agree with you that it is, out side of this site. Why won’t the wind turbine companies build wind farms without a guaranteed RET, there is nothing stopping them, if wind power was so viable, Ceres should have been operating now? Evidence Tania, evidence! If, as you claim, coal in Leigh Creek is to run out by 2017 why has closing down the mine and power station in 2018 been such a shock to everyone involved? If you are not Tania Stock you can easily prove it by giving your name. Most people seem to think that you are Tania. if you like, think of Tania as my pet name for you; it’s nice to have a name when conversing. I will give you the evidence, when you give me a straight answer to my question! You are big on questions, short on answers! You can call me whatever makes you feel good, it makes no difference to me. Ramblings is not a credible source of information! As expected, there is no answer to my question, because he does not have one. How many times do I have to answer that question Tania? 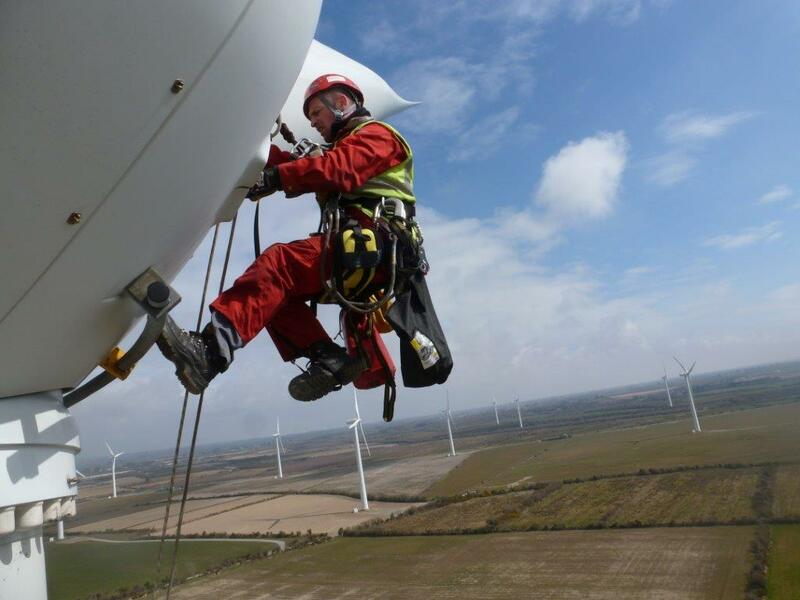 Wind energy could compete if there was a ‘level playing field’. There is not. So long as fossil fueled power stations can dump their wastes into the atmosphere – killing millions of people each year, producing climate change, causing the acidification of the oceans – at no cost to the operators it will be hard for clean energy to compete. That is the first time that you actually attempted to answer that question, Renfrey. I would not call the RET and Renewable Energy Certificates payable to the wind power generators by the electricity consumers of this country, a level playing field. I am sure the coal fueled generators would not see it that way.